Lucky for you carrots are surprisingly easy to grow, and they tolerate great differences in growing conditions and techniques. Carrots need steady watering—especially early on—and regular weeding, but that’s about as finicky as they get. Carrots love cold climates, and can be grown in beds, containers and even window boxes making them suitable for gardens of any size, and can be planted from April to July at three week intervals. Paris Market - These small, orange, and nearly spherical carrots grow only 1 to 2 inches in diameter. Making them very unique! The shape of them is less like a traditional carrot, and more like a large radish. But what theses carrots lack in size, they make up for in flavour. Paris Market carrots are highly sought after by organic gourmet restaurants. You'll love the sweetness of these old french heirlooms! These carrots are easy to grow, even in heavy soils, and are perfect for home gardens and patio containers. Rainbow Blend - Did you know that rainbows actually start under-ground? The rainbow blend is a mixture of Atomic Red, Bambino, Cosmic Purple, Lunar White, and Solar Yellow carrots. The carrots in this colourful mixture grow to between 12 and 28 cm long and yield about a half kilogram of vegetables per foot of seeds. Not only do this carrots make a visually pleasing dish when cooked or chopped, they'll also be sure to please your taste buds! Red offers a crisp texture and high levels of lycopene. Yellow has a refreshing sweet flavour and is extra crunchy and juicy. Sweet and tasty purple boasts a striking plum outer colour and core-less orange flesh that's a gourmet wonder. Mild and delicious white completes the mix. Purple Sun - Whether you eat them raw or cooked, these great-looking, big dark purple carrots from Holland grow vigorously, and combine wonderful colour, excellent sweet flavour and a crisp texture. These plump, conical carrots size up nicely and taper evenly from rounded shoulders to pointed tips. And at the centre is a little yellow sun. 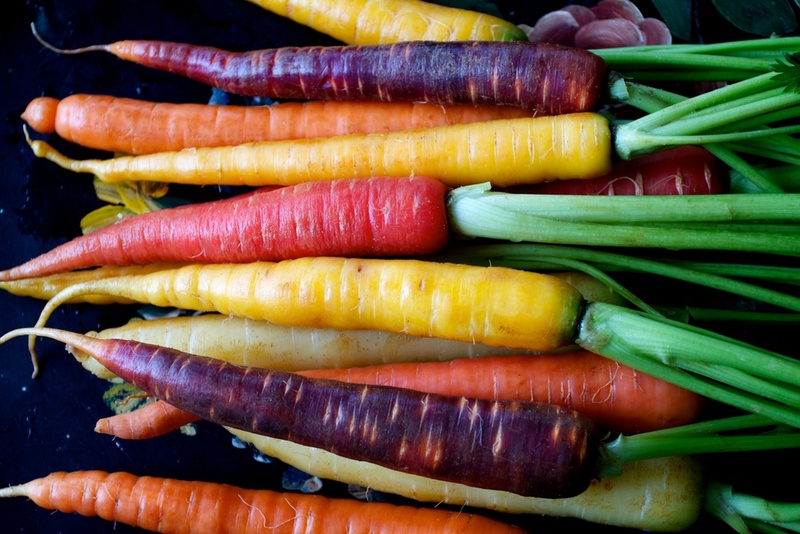 Purple Sun carrots are loaded with antioxidant flavonoids, so they taste great and offer real health benefits. King Midas - King Midas carrots offers large size and rich, fully-developed carrot flavour. The vigorous roots grow steadily into smooth, nearly core-less 20 to 22 cm beauties, slightly tapered with pointed tips. The well-filled carrots have the deep orange flesh that indicates an especially high level of beta-carotene. Slice them into crunchy carrot sticks snacks, or fat carrot "coins" to lightly steam, sauté, or stir-fry. Kuroda Nova - If you love juicing your vegetables, you'd be hard pressed to find a better juicing variety than the Kuroda Nova carrot. This popular carrot from Asia has deep red and orange roots with excellent sweet flavour, growing to 18-20 cm long. Eat them raw, sliced up as tasty fresh snacks, sauteed, steamed or braised. And set off their flavour with fresh lemon or orange juice and a sprinkling of minced herbs like fresh mint or thyme. Or glaze them with a little honey, ginger or cinnamon.